Sending Evan’s lunch every day has been pretty easy so far. He fights against any variance from his standbys of ham sandwich or humus & pita chips. I’m okay with that, though, since both fit into the school lunch policy. We round out his lunch with fruits and veggies and the occasional treat. I wanted to keep it on the straight and narrow until I could suss out Evan’s teacher a bit better. Thankfully, we’ve been smiled upon by the Nice Teacher gods so no worries there. Today I had a bit of extra time and a bit of extra zucchini. What is a girl to do? Make muffins, of course! These are pretty healthy but the addition of chocolate chips means that kids will think they are a big treat. We won’t break the news to them that they have veggies in them, right? 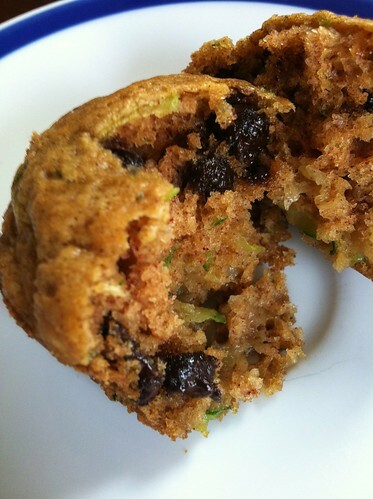 Chocolate Chip Zucchini Muffins - Perfect for the Lunchbox! Use up your summer zucchini with these easy and delicious muffins. Grease 12 muffin cups or use muffin papers. Mix together first 5 ingredients in a large bowl. Mix together milk & lemon juice and let sit for a few minutes. Add other wet ingredients to milk/lemon juice mixture. Mix well. Add wet ingredients to dry ingredients and mix until just blended. Bake for 20 minutes or until toothpick comes out clean when inserted in the middle of a muffin. Note….somehow I managed to forget to add the egg. They were awesome anyway though I think the egg would add some structural stability so I will add it next time. What is your favorite muffin to send with your kids? I made them again today. I meant to try it with honey but I forgot. Good to know that it works well as a sub for sugar in this recipe. My kids love anything pumpkin so I make loaves and muffins with that. I add quinoa flakes, flax seeds and anything else I can use to bump up the health factor. I find I hardly need to use any sugar and always throw in a few chocolate chips. I struggle with things to send for the bulk of lunch due to the no nuts policy and the fact that I don’t like to send nitrates. One of mine also doesn’t much like cheese (arg)…so I do better with the bento style lunch for him. Thank goodness for Yogurt! Can’t wait to try your recipe. Hi….can’t wait to make this muffin recipe! Just saw a frozen 1c. bag of shredded zuch. in my freezer last night and thought ‘must make something with that soon’ for my boys! My reason for emailing is really going to sound weird…in the pic. of you (in the purple) above your ‘I’m a mom/stepmom…” bio paragraph you are wearing a terrific shade of lipstick….care to share what brand/shade it is? I’m always on the hunt for a great shade of lipstick and we have similar skin tones, eye colour, etc. and I think I would really like this shade…Thanks! And I’m sure we’ll love the muffins once I find time and a cooler evening to turn on the oven! Perfect for taking on summer day-trips! I made these muffins this afternoon, and they turned out great! I used applesauce instead of oil (mostly because I had applesauce I needed to get through), and I think that made them even more moist. I also added some Hershey’s Dark Cocoa powder to half of them, and those ones are AMAZING. They taste almost like the chocolate chocolate chip muffins from Costco. Thanks for a great recipe!